Panic! 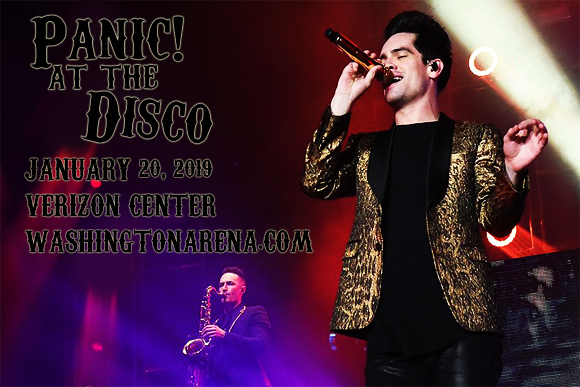 At The Disco comes to Verizon Center on Sunday 20th January 2019 on the hotly anticipated Pray For The Wicked Tour! Brendon Urie and his band will be serving their theatrical pop-rock wizardry in their own spectacular way, with a full headlining set of tracks from their new album, plus support from Harlem singer-songwriter Two Feet! American rock band Panic! At The Disco was formed in Las Vegas, Nevada in 2004 by high school friends Ryan Ross, Spencer Smith, Brent Wilson and Brendon Urie. The band made waves with the release of their debut studio album, A Fever You Can't Sweat Out (2005), which went double-platinum and launched the US Top Ten single "I Write Sins Not Tragedies". To date, the band has released six successful studio albums, with significant changes to both line-up and musical direction over the years, and currently lead singer Brandon Urie is the band's only official member. Panic! At The Disco's most recent album, Pray For The Wicked, was released on June 22, 2018.